The 18th-century introduction of Freemasonry in America led to the establishment of many local lodges by 1800. Few of these lodges had the luxury of their own building, and local taverns often assumed the role of hosting meetings. Luther Holcomb, a Granby mason, operated such a tavern in the Turkey Hills section of what is now East Granby in the first decade of the 19th century. Not surprisingly, Holcomb’s sign reflected his own fraternal affiliation by incorporating some Masonic imagery on one side. In addition to the familiar square and compass symbols, the sign incorporates other Masonic imagery such as the pillars of King Solomon’s Temple, the anchor of Hope, and the all-seeing eye. Patriotic themes frequently complemented Masonic symbols on such signs and this example is no exception: the opposite side features patriotic imagery characteristic of the era of the Early Republic. The term “ENTERTAINMENT” on Holcomb’s sign told travelers and local residents alike that the tavern provided not only food but also lodging. As fixtures of town and city life in the 18th and 19th centuries, taverns often provided convenient venues for exchange of news, exotic traveling entertainments, and, not surprisingly, even political debate, public and private. 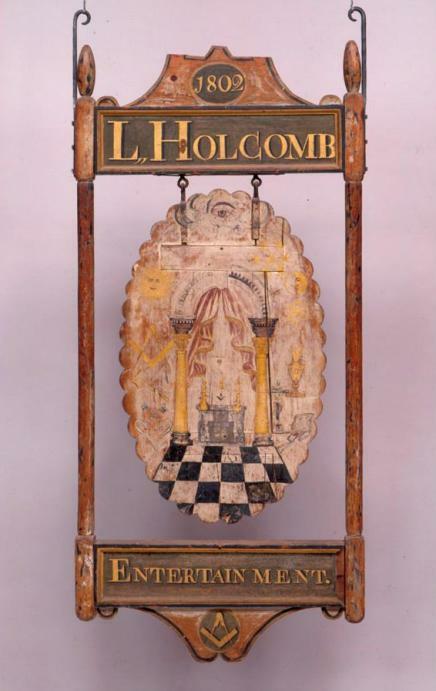 The Holcomb sign, with its unusual free-swinging elliptical panel within the frame, would have been suspended from the tavern itself or hung from a pole in front of the building. Long the property of a Simsbury Masonic lodge, the Holcomb sign recently became the latest addition to the Connecticut Historical Society’s fabulous sign collection. Schoelwer, Susan P., ed. Lions & Eagles & Bulls: Early American Tavern & Inn Signs from the Connecticut Historical Society. Hartford, CT: Connecticut Historical Society, 2000.